The Enfield–Suffield Covered Bridge was a wooden covered bridge over the Connecticut River located between Enfield, Connecticut and Suffield, Connecticut. This bridge connected Bridge Lane on the Enfield (east) side of the river with the west side of the river, where Bridge Street met it. There is now a parallel row of trees on this west side of the river where the street once ran. All that remains of this bridge at this time are submerged piers in the river. These are partially overgrown with vegetation. Half of this bridge was destroyed in a flood on 2 February 1900. Hosea Keach, agent for the railroad at Bridge Lane Station, which was at the entrance to the bridge, was on the bridge when it collapsed. He rode the span down the river, and climbed to the roof, where he was seen by two railroad employees at the Warehouse Point bridge, Arthur Blodgett and R. A. Abbe. They lowered a rope from the railroad bridge as he passed below, rescuing him. The remains of the bridge were purchased by Southern New England Telephone, which blew up the remaining part of the bridge and used the piers for carrying telephone wires across the river. ^ Whittlesey, Charles W. (1938). Crossing and Re-Crossing the Connecticut River. 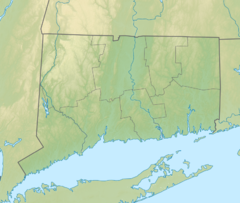 New Haven, Connecticut: The Tuttle, Morehouse & Taylor Company. p. 50. This article about a bridge in Connecticut is a stub. You can help Wikipedia by expanding it. This page was last edited on 14 November 2017, at 06:46 (UTC).